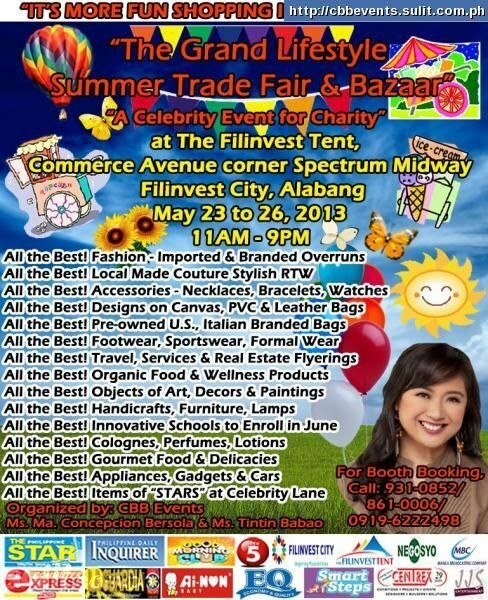 CBB Events are glad to inform you that the "Summer Lifestyle Trade Fair and Bazaar" is on May 23, 24, 25, 26 - 2013, with shopping time from 11AM to 9PM at the same newest, classy, beautifully elegant venue: The Filinvest Tent. located at Filinvest City, Alabang. The organizers wish to extend the info. Apparently, there had been a change of date, due to the request of some importer merchants because the great bulk of their new products is due to come from abroad by May. On the part of exporters and online entrepreneurs, more new styles and creations are coming out on the month of May. Upon noting this, they are welcoming investors and entrepreneurs who wish to showcase their products to the market on levels Class A and B from residents of high-end villages and corporate offices' staff from the surrounding area. Here are the specifications of the booth, feel free to choose the ones that suit your business-needs which for sure will lead to surprising big income starting the event this May. Moreover, check out important details on the booth you may want to rent out. 4.) The P10,000 booths will be half of any of the vacant 4 sqm. booths which will be divided into two by a 2 meter wall partition. The half booths will be treated as solo booths with 3 meter walls for hanging display. Ma. Concepcion P. Bersola and Christine Babao of CBB Events would love to have you join this charity event for a cause. Thank you very much for this well written article. Will check some of them up.